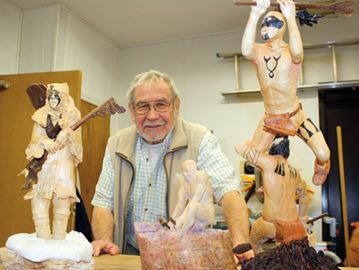 This past weekend, March 28-9, was the Niagara Carving Show. This show is one of the highlights of my carving calendar. From the outstanding venue at Heartland Forest, to the quality of the carvings, the seminars and the show tables, this one has it all. Visitors to the show also enjoy the door prizes, silent auction and great food — both from the kitchen and the chip truck outside. The organizers, the Niagara Woodcarvers Association, hold their annual dinner during the show, which includes awards and entertainment. If you live in the Niagara area and are interested in carving, this is a great group to join. They hold classes and monthly meetings, and have worked on several large projects in the region. A key feature of the Niagara show are the seminars by master carvers. This year’s presenters were Tom Gallagher (president of the Ontario Wood Carvers Association) and Doug Maracle, who was also featured on the cover of Niagara This Week. Doug’s exceptional carvings have been presented to heads of state and featured in gallery showings, and his Niagara talk was a great opportunity to gain some insight into how he goes about his work. While in Niagara, I stayed at a wonderful B&B called The Hoblet. More than just a place to rest your head, the hoblet is a donkey sanctuary. In fact, owners Petra and Mush rescue not only donkeys, but goats and pigs as well — and the animals are enthusiastic about becoming your friends (though it has to be said, the carrots help). From the outside, the cabin appears rustic, down a lane, almost camouflaged by the trees; inside, the space caters to your comforts, right down to the indoor sauna. 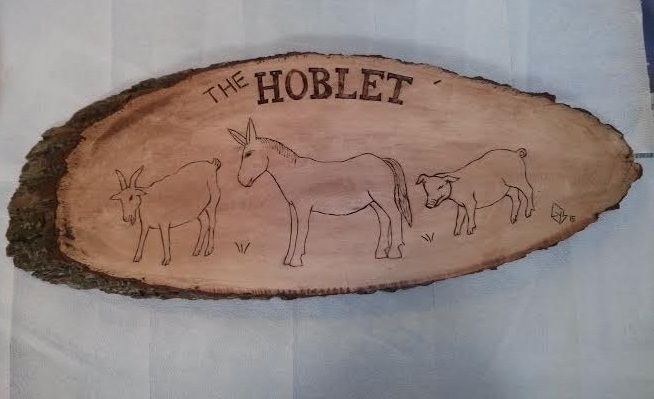 Your stay at The Hoblet supports hay, farriers and other costs of caring for the animals. I was so entranced that I made them a new sign. This entry was posted in Uncategorized and tagged Doug Maracle, Niagara Woodcarvers Association, The Hoblet, woodcarving competition and show on 30/03/2015 by diamondcarving.